The Royal Swedish Academy is a venerable institution and as the title states, has the goal of spreading knowledge about science and in this case, research published in scientific journals. The normal criteria for publications mean that the work is reviewed by impartial specialists or by an opponent. The reviewer must check that the arguments for and against are justified. Science therefore must be objective! On 23 October 2017 the Royal Swedish Academy of Science invited a select few participants to a seminar about Homeopathy during which the classic rules for impartiality and objectivity were openly flouted and ignored. Many people in medical circles know that Professor Dan Larhammar, President for Royal Swedish Academy of Science and the key speaker at this unfortunate seminar, is a fierce opponent of everything connected with so-called Alternative Medicine and he is vehemently against Homeopathy. Therefore it is most unusual that the Academy did not invite anyone to defend Homeopathy so that both sides could be heard. 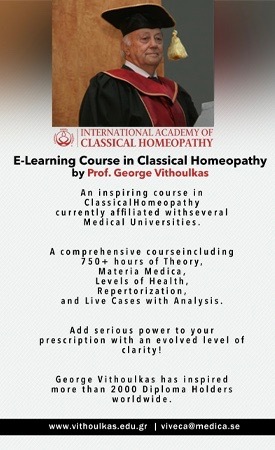 If the Academy is going to arrange a seminar on a particular subject, in this case Homeopathy, surely to protect its reputation for objectivity, the Academy has to allow a qualified Homeopath also address the participants to present the case for Homeopathy. Dan Larhammar, as far as anyone is aware, has never studied in a homeopathic school and has no credentials or degree in Homeopathy. As far as we know he has never treated a patient either with Homeopathy or conventional medicine. For many years Dan Larhammar has made claims that homeopathic medicines have no effect: he has even called Homeopathy “bluff” medicine. Professor Robert Hahn, head of research at Södertälje Hospital, has made a very thorough meta-analysis of 230 scientific research studies of Homeopathy and he found that the results were twice as good as mere placebo. Does the Academy find that Robert Hahn‘s meta-analysis is flawed or faulty by not inviting him to address such a gathering? If this is the case, would the Academy then carefully read his research as inform us where the mistakes are? No matter which conclusion such an inquiry may come to, we affirm that by not inviting anyone to give the arguments in favour of Homeopathy and against Larhammar’s views that the Academy has acted in a prejudiced manner and that its actions in this case are seriously unscientific and gravely undermine its reputation of being impartial. We look forward to receiving your answers concerning Robert Hahn’s meta-analysis and we also would like an explanation, for what we can only regard and a deeply unethical and flawed act in arranging such a one-sided and unscientific event.